A leading candidate for Mongolia’s presidency has called for greater state control of projects like the giant Oyu Tolgoi copper-gold mine run by Rio Tinto, making mining and foreign investment central issues in the election campaign. The landlocked North Asian country of three million people goes to the polls on June 26, just a month after securing a $5.5 billion International Monetary Fund-led bailout to lift the economy out of a balance of payments crisis. 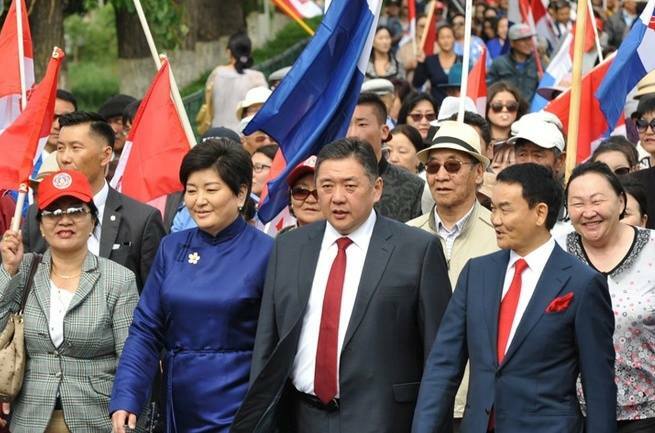 Campaigning began on Tuesday, and painful austerity measures agreed by the Mongolian People’s Party (MPP), which runs the government but doesn’t hold the presidency, have made an easy target for rivals, as have controversies over deals done with foreign mining companies. The presidential election in the former Soviet satellite, wedged between China and Russia, comes amid growing frustration among voters over suspected corruption and the perceived ineffectiveness of their governments. Under Mongolia’s parliamentary democracy, the MPP government’s term should run for another three years, but its policies could be challenged by a president with veto powers. The outgoing president Tsakhia Elbegdorj belongs to the Democratic Party, but has to step down having served a maximum two terms. The Democratic Party’s new candidate Khaltmaa Battulga, a martial arts star turned business tycoon, opened his campaign with a call for greater government control over the economy and the country’s mineral resources. “Our political environment is very unstable, so our big development policy won’t go forward. Because of that, we can’t solve unemployment or poverty,” Battulga told CI Television in an interview posted on the network’s official Facebook account late on Tuesday. “The government should hire experts and take control of everything, including Oyu Tolgoi and Tavan Tolgoi,” he said. His comments could send shudders through Rio Tinto, which owns 66 percent of Oyu Tolgoi, and scare off private companies that might be interested in forming strategic partnerships at the giant, fully state-owned Tavan Tolgoi coal mine. Oyu Tolgoi LLC, the Mongolia-based company that runs the project, declined to comment. Rio Tinto did not immediately respond to requests for comment. Dale Choi, analyst and head of the Altan Bumba Financial Group, said the Mongolian government did not have a good record when it came to managing its assets. “Most of the SOEs are loss making businesses, and even those that pay some of the highest taxes to Mongolia are not efficient businesses,” he said. The ruling MPP candidate Mieygombo Enkhbold, has called for continued “stability”, while the government struggles to introduce economic reforms having already raised some taxes and cut spending as part of the IMF bailout deal. Nationalist politicians have repeatedly called for greater Mongolian control over Oyu Tolgoi, which is forecast to become the world’s third-largest copper producer when output peaks at 550,000 tonnes in 2025, up fourfold from this year. A third party candidate Sainkhuu Ganbaatar, who is expected to win enough votes to force Mongolia’s first-ever second round presidential election run-off, has continued his hardline stance when it comes to Mongolia’s ownership of its resources. “The Mongolian people in Mongolia are the real master. This means that Mongolians are the deciders of their natural resources,” he said in his manifesto. Attempts to renegotiate ownership and a long dispute over taxes and cost overruns led to the suspension of construction on the underground tunnels at Oyu Tolgoi in 2013, and also scared off investment for other projects. Construction on the project was relaunched after the signing of a new agreement that ended the dispute in 2015. During its first phase, the open pit mine had already contributed more than $1 billion in taxes and other payments to the government by 2015, while local businesses and suppliers had earned some $4 billion from the project, according to the International Finance Corporation.